Hello everybody and welcome to another great game review. This time we are looking at a game called Paper.io 2. This game is published and developed by Voodoo. I think that we are all have played Slither.io. This game was a great online hit and it was based on the classic Snake game but in MMO mode. This game is much similar but instead of growing a snake, you are taking territory by drawing zones in different colors. The goal is to take az much space on the whiteboard as possible. This little twist of the game made a huge impact and now this game is now of the most played games on the Google Play Store. Papier.io 2 is something that you can play in your free time while waiting for a bus or waiting for your coffee. This game is something that can be pretty addicting too, and all of this is because of the simplicity of the game. But at the same time, it is pretty hard to master. There are a lot of players and all of them want to get 100 percent of the whiteboard. So be ready and don`t forget your patience for this one. The gameplay in Paper.io 2 is something simple and easy to get, but hard to master. As I said you are in a room with so many people and only one goal, to get as much space on the whiteboard as possible. Every player is spawned on a different time, and some of them will be ahead of you, some of the players will be after you. I am not so sure how you can get 100 percent in this thing. I have been working on strategies for about 3 days now. So far I cannot get past 10%, so I tried only hunting down opponents, just circling the perimeter and I tried just building my area with small loops. So far none seem viable. So there you go. 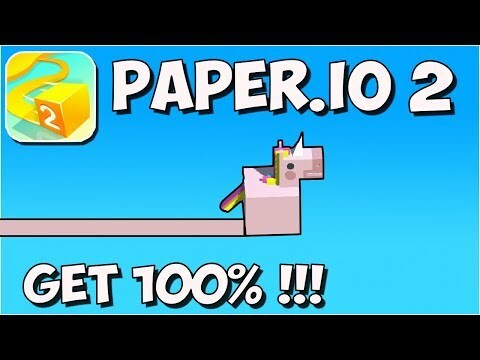 Papier.io 2 is a simple and yet hard game. you can get pretty irritated by some players because there are times when you can play for twenty minutes and some random guy joins in and takes all of your points. The balanced part is that you can do that as well. There is some satisfying feeling in this until you die, and you have to start over. This game, in my opinion, is something that you have to try, and kill some time.